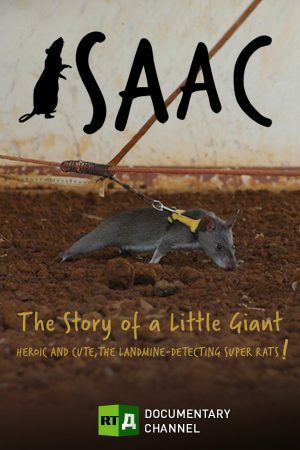 Isaac is a giant pouched rat that saves human lives. He was born in a special training center in Tanzania called APOPO, which stands for development of landmine detection equipment. Isaac is a mine-sniffing rat. The reason why rats were chosen for this project is that they can adapt to different environments and have lived in symbiosis with humans for centuries. Traditionally, rats have gotten rid of the garbage produced by humans. That’s the way it has always been and getting rid of landmines is no different. These rats are taken to former hotspots where landmines are a deadly remnant of conflicts. The training begins when the rat is four weeks old and it will take nine months before he becomes a full pro. The first part of the training consists of helping the rats to feel comfortable around people. They are exposed to the sounds of different engines and they learn to interact with a handler. These giant rats are very curious and social. This means that they are willing to work with humans. It’s no coincidence that the giant rats were chosen to search for landmines. In the wild, they are able to search for food that is buried deep in the ground. They are trained to equate the discovery of TNT in the mines with the smell of food. Whenever the rat finds a container that has TNT, there’s a click, which gives him the right to claim a treat. That is how they are trained to identify the landmines. Just before the rats find the explosive they portray a certain behavior. Some stop to groom themselves, others walk around in circles, and some stand and sniff the air. This makes the handler know that the rat has found something. The rat’s remarkable sense of smell can detect even tiny traces of TNT. They can sense the explosive even when its 15 to 20 centimeters underground. At the training center, the rats are fed bananas, corn and nuts. On the weekends they receive a delicious combination of peanuts and dried fish. Their meal plan includes watermelon as dessert. These foods provide the vitamins and calories they need to be at the top of their game. Part of the training includes learning to follow their handler voluntarily, without a leash. It’s a relationship of deep trust. Watch this film now. There’s a program called Heroes and Horses that is focused on helping combat veterans to heal. 20% of veterans with PTSD become addicted to drugs. Endangered species don’t have to become extinct if they receive good care. For instance, mother pandas can only rear one child at a time, yet they usually give birth to two. With the cameras in hot pursuit, Derren faces his toughest project yet, going in search of an unsuspecting member of the British public prepared to adopt the guise of a pastor and miracle worker.